Recently, informal workers have seized a majority of total workforce in the developing world. Casual workers, unpaid family workers and own-account workers are part of this informal army workforce. In the era of global economic liberalization since 1980s, the number of these workers has risen continuously. Apparently, for the neoclassical economists, it seems nothing to be worried about this trend. For these economists, informal workers are likely to be micro-entrepreneurs, developing small business to enhance their social vertical mobility. It is believed that if the market is allowed to function properly, micro-entrepreneurs would be able to transform their business into formal arrangement and thus eliminate informal economy. The state intervention has to stay away from this business activity. The only task expected from the state is to establish and maintain a proper institutional setting for sound business climate. This paper problematizes this claim by analysing the impact of neoliberal adjustment to the expansion of the concept called relative surplus population. Focusing on Indonesia’s development trajectory, the paper shows that, firstly, instead of being micro-entrepreneurs, a majority of informal workers are likely to be vulnerable workers, marked by lacking of fundamental rights of workers in term of remuneration, representation and social protection. Along with unemployed, vulnerable workers are best captured as relative surplus population due to it is created in the context of ‘disconnected capital accumulation’ in a peripheral country. Relative surplus population works outside the core of capitalist productivity and in precarious condition. Secondly, market-led orientation, contrary to the claim to erase informal employment and ultimately relative surplus population, it is likely to perpetuate it. Global market orientation brought about by neoliberal adjustment has contributed to the in-creasing number of relative surplus population. 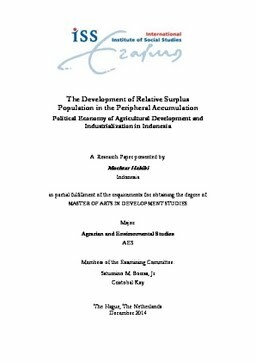 This paper indicates how neoliberal adjustment (economic liberalization) in Indonesia has transformed class relation and subsequently established neoliberal state which is heavily loaded by international capital interest. Neoliberal state, to serve international capital, has shifted the inward-looking economy towards outward-looking orientation. This global market orientation has led to the disconnection of the domestic economy, between agriculture and industry. A large number of agricultural workers who have been separated from their means of subsistence cannot find productive and decent employment in the industry since export-oriented strategy has only created limited job opportunities. This paper proposes that any attempt to take care of relative surplus population entails structural shift both in the class relation and the nature of the state. A relatively equal balance of power between capital and labour is required to transform the neoliberal state into developmental state, promoting domestic oriented economy. Eventually, domestic oriented economy is expected to develop productive and decent jobs to take care of the huge number of relative surplus population.